It can be hard to say what works, but we need an enduring commitment to empowerment and self-liberation rather than unhelpful images of pleading hands and whipped backs. As with any movement for rights and justice, the contemporary anti-slavery and anti-trafficking movement draws upon a range of rhetorical and mobilisation strategies; from digital billboards, pop-up installations and mock auctions, to awareness-raising surveys, exhibitions and animated documentaries. However, without further data on campaigns’ practical impact on policy agendas, funding levels, risk-awareness, and slavery prevalence, we cannot yet answer “yes” to the important question of whether they have been positive. We do not yet have a sufficient body of research that documents their efficacy. What kind of data, platforms, dissemination methods, and partnerships support effective change? What can the contemporary anti-slavery movement learn from how other social justice movements use research results, imagery, and public engagement? What can other movements learn from anti-slavery? Our current analytic shortcomings are part of a larger gap in monitoring and evaluation. With some exceptions, much resource devoted to anti-slavery work is spent without pre- and post-intervention testing or evaluations of its effectiveness. This is especially the case when it comes to ‘awareness raising’. 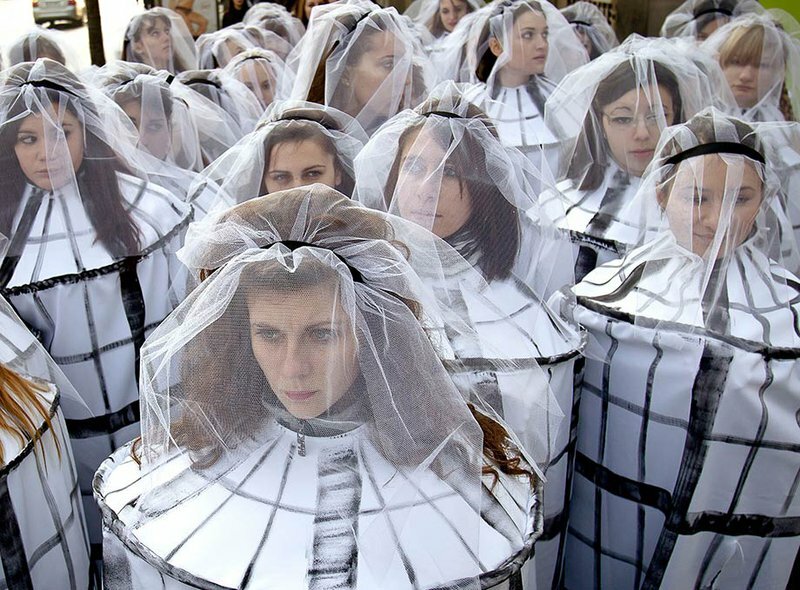 Students dressed as caged brides protest human trafficking and sexual exploitation in Bucharest, Romania, in 2011. Vadim Ghirda/AP/Press Association. All rights reserved. While we can’t yet demonstrate the positive impact of campaigns with any rigour, the recent history of awareness-raising does offer several cautionary tales. One recurring issue is statistical cherry-picking. Many organisations have been tempted to play fast and loose with numbers, which risks underpinning funding and policy decisions with misleading campaigns. Take, for example, the second paragraph of the EU Strategy towards the Eradication of Trafficking in Human Beings 2012–2016. It mentions 20.9 million victims of forced labour, which is an International Labour Organisation (ILO) statistic. The fourth paragraph adds that 79% of trafficking victims were subject to sexual exploitation, which is a statistic from the United Nations Office on Drugs and Crime (UNODC). The document links these statistics together via a footnote, which declares that human trafficking can be regarded as the same as forced labour, in turn paving the way for an implication that 79% of the 20.9 million are caught in forced sexual exploitation. Statistical manoeuvring creates the impression that sexual exploitation greatly exceeds labour exploitation, yet the underlying research found the exact opposite. However, the UNODC statistic actually refers to 79% of the 2.5 million people who it categorises as victims of trafficking (i.e., around 12% of the world’s slaves as counted by the ILO). As the ILO report makes clear, only 22% of the 20.9 million slaves are victims of forced sexual exploitation, and 68% are victims of forced labour exploitation (with a further 10% in state-imposed enslavement). All of this statistical manoeuvring creates the impression that sexual exploitation greatly exceeds labour exploitation, yet the underlying research found the exact opposite. This is important, because how we think about prevalence in turn shapes how we craft campaigns and policies. It builds a focus on sexual exploitation to a degree not merited by the available research. The concentration upon cross-border trafficking and sexual exploitation also tends to generate particularly problematic forms of visual representation. For example, one of the only featured visual series by the European Commission's hub “Together Against Trafficking in Human Beings” focuses on the “disposable bodies” of “female human trafficking victims”: naked women chained, muzzled, huddled and sprawled. With some exceptions, campaigns pushing strategies of rescue and slave redemption tend to minimise the agency of survivors. I’ve written elsewhere about the broader visual culture of paternalism, dehumanisation, and sensationalism that is at full throttle in this “Human Commodity” series. More recently, the 2016 issue of the Anti-Trafficking Review offered an in-depth critique of stereotypical trafficking representations. And after examining thousands of pieces of anti-slavery and anti-trafficking campaign material, I believe there is a close relationship between campaign rhetoric/imagery and organisation focus/mission. Campaign culture matters. Its rhetoric and imagery shapes our attitudes towards enslaved people and the policies that we push and debate. The enduring notion that slaves need pity and rescue should be replaced with campaigns and policies that promote empowerment and self-liberation. To change this culture, we need to theorise the nature of the anti-slavery appeal, study anti-slavery influencing initiatives, and build an evidence base for campaign and intervention efficacy. We need a collaborative, large-scale monitoring and evaluation platform that helps us to assess the scale and penetration of existing awareness campaigns, and establish effective, fact-based campaigns that support evidence-based programmes. That new context would require a more rigorous use of data by campaigning bodies, and in turn might engender a shift in focus from a campaign culture of victimhood to one of empowered resistance.